Behavioral disorders also known as conduct disorders are one of the most common forms of psycho pathology among kids and young adults and is the most frequently cited reason for referral to mental health services. The appearance of behavioral disorders is increasing dramatically in our K-12 classrooms. As a result their presence severely constrains the ability of the school systems to educate children effectively. The prevalence of behavioral problems among kids and young adults is substantial. Many surveys indicate that behavioral disorders vary among young adults, ranging from 2 and 6% in K-12 children. This percentage translates into 1.3 to 3.8 million cases of behavioral disorders among the school and pre-college population. • A display of bullying, threatening, or intimidating behavior. • Being physically abusive of others. • Deliberate destruction of other's property. • Initiation of aggressive behavior and reacting aggressively towards others. • Showing callous behavior towards others and lack of feelings of guilt or remorse. • Showing little empathy and concern for the feelings, wishes, and well being of others. • They may readily inform on their companions and tend to blame others for their own misdeeds. • Administer consequences immediately, then monitor proper behavior frequently. • As a teacher, you should be patient, sensitive, a good listener, fair and consistent in your treatment of children with behavioral disorders. • Ask previous educators about interactive techniques that have previously been effective with the ODD student in the past. • Bring to the ODD student's attention science role models with disabilities with a similar disability to that of the student. Point out that this individual got ahead by a combination of effort and by asking for help when needed. • Change rewards if they are not effective for motivating behavioral change. • Determine whether the ODD student is on medication, what the schedule is, and what the medication effects may be on his or her in class demeanor with and without medication. Then adjust teaching strategies accordingly. • Develop a schedule for applying positive reinforcement in all educational environments. • Devise a contingency plan with the ODD student in which inappropriate forms of response are replaced by appropriate ones. • Direct instruction or target behaviors is often required to help children master them. • Do not expect children with behavioral disorders to have immediate success; work for improvement on a overall basis. • Encourage others to be friendly with children who have emotional disorders. • Enforce classroom rules consistently. • Expose children with behavioral disorders to other children who demonstrate the appropriate behaviors. • Have pre-established consequences for misbehavior. • In group activities, acknowledge the contributions of the ODD student with a behavioral disorder. • Make sure the discipline fits the "crime," without harshness. • Monitor the ODD student's self-esteem. Assist in modification, as needed. • Praise immediately at all good behavior and performance. • Present a sense of high degree of possessiveness in the classroom environment. • Reward more than you punish, in order to build self-esteem. • Self-esteem and interpersonal skills are especially essential for all children with emotional disorders. • Treat the ODD student with the behavioral disorder as an individual who is deserving of respect and consideration. • Use time-out sessions to cool off disruptive behavior and as a break if the ODD student needs one for a disability-related reason. • When appropriate, seek input from the ODD student about their strengths, weaknesses and goals. • After a week, or so, of observation, try to anticipate classroom situations where the student's emotional state will be vulnerable and be prepared to apply the appropriate mitigative strategies. • As an educator you serve a model for the children who are behaviorally disturbed. Your actions therefore, must be consistent, mature, and controlled. Behavioral outbursts and/or angry shouting at children inhibit rather than enhance a classroom. • Be fair and consistent, but temper your consistency with flexibility. • Be positive and supportive. • By using examples, encourage children to learn science so they can emulate adult behaviors. • Check on the ODD student's basic capacity to communicate and adjust your communications efforts accordingly. • Consultation with other specialists, including the special education teacher, school psychologist, and others may prove helpful in devising effective strategies. • Devise a structured behavioral management program. • Find ways to encourage the ODD student. • Group participation in activities is highly desirable because it makes social contacts possible. • Have the individual with the behavioral disorder be in charge of an activity which can often reduce the aggressiveness. • If unstructured activities must occur, you must clearly distinguish them from structured activities in terms of time, place, and expectations. • Instructions should be simple and very structured. • Keep an organized classroom learning environment. • Let your children know the expectations you have, the objectives that have been established for the activity, and the help you will give them in achieving objectives. • Monitor the ODD student carefully to ensure that children without disabilities do not dominate the activity or detract in any way from the successful performance of the ODD student with the behavioral disorder. • Plan for successful participation in the activities by the children. Success is extremely important to them. • Praise immediately and all good behavior and performance. • Present a sense of positiveness in the learning environment. • Provide a carefully structured learning environment with regard to physical features of the room, scheduling, routines, and rules of conduct. • Remain calm, state the infraction of the rule, and avoid debating or arguing with the ODD student with a behavioral disorder. • Show confidence in the children ability and set goals that realistically can be achieved. • Some aggressive children act as they do because of a subconscious desire for attention, and it is possible to modify their behavior by giving them recognition. • Special efforts should be made to encourage and easily facilitate children with behavioral disorders to interact. • Educators should reward children for good behavior and withhold reinforcement for inappropriate behavior. • The environment must be structured but sensitive to the needs of these youth with behavioral disorders. • Use a wide variety of instructional equipment which can be displayed for the children to look at and handle. • When an interest in a particular piece has been kindled, the instructor can talk to the ODD student about it and show him or her how to use it. • When appropriate, seek input from the children about their strengths, weaknesses and goals. • You should refer the children to visual aids and reading materials that may be used to learn more about the techniques of skill performance. 1. Activity instructions should be simple but structured. 2. Be sensitive when making team pairings for activities so that the ODD student with an emotional disorder is supported. 3. Consider alternate activities/exercises that can be utilized with less difficulty for the ODD student, but has the same or similar learning objectives. 4. Every effort should be made to arouse the interest of such children in laboratory activities, so they will learn to perform the activities with success and pleasure. 5. If a ODD student must be denied permission to use the equipment, this should be done on an impersonal basis so the student will not feel hurt or discriminated against. 6. If unstructured activities must occur, you must clearly distinguish them from structured activated in terms of time, place, and expectations. 7. If unstructured activities must occur, you must clearly distinguish them from structured activated in terms of time, place, and expectations. 8. Monitor carefully to ensure that the children without disabilities do not dominate the activity or detract in any way from the successful performance of the ODD student with the behavioral disorder. 9. Plan for successful participation in the laboratory activities by the children with behavioral disorder. Success is extremely important to them. 10. Some children with behavioral disorders may go to great lengths to avoid class participation. To feign their disorder is the method most frequently used, in hope of being excused from participation. 11. Special efforts should be made to get children with behavioral disorders to interact in laboratory activities. 12. To ensure success consider the special needs and interests of each person; give friendly, patient instruction in the laboratory skills; and continually encourage a wider interest in activities. 13. Use a wide variety of instructional equipment which can be displayed for the children to look at and handle. 14. When a ODD student displays a reaction of dislike to the activities this dislike usually stems from fear or lack of experience for the activity or factors inherent within the situation itself. 15. When an interest in a particular piece has been kindled, the instructor can talk to the ODD student about it and show him or her how to use it. • Acknowledge the contributions of the ODD student with an emotional disorder. • Along with the student, devise a contingency plan in which inappropriate forms of response are replaced by appropriate ones. • As the ODD student's comfort level rises and when a safe topic is available, encourage the student to be a group spokesperson. • Call for responses and participation commensurate with the ODD student's socialization skills. • Gradually increase the challenges in the student's participation in group exercises while providing increased positive reinforcement. • Help the ODD student to feel as though he or she has something worthwhile to contribute to the discussion. • Should monitor carefully to ensure that the nondisabled children do not dominate the discussion or detract in any way from the successful performance of the student with the behavioral disorder. • Some children may experience considerable strain in social adjustment in a group context. It may be necessary to work gradually toward group activities. One can devise a strategy of progressing from spectatorship to one-to-one instruction and eventually to small group discussion. 2. Increasing positive relationships by means of awards when they read appropriately. 3. Reading in group or with others. 4. Taking turns, working with partner, following directions. • Depending on the site of the research check the previous two sections. • Review and discuss with the ODD student the steps involved in a research activity. Think about which step(s) may be difficult for the specific functional limitations of the student and jointly devise accommodations for that ODD student. • Show clear examples of what the children should expect as an outcome of their research. • Use appropriate laboratory and field strategies. • Consider alternate activities/exercises that can be utilized with less difficulty for the ODD student, but has the same or similar learning objectives. • Every effort should be made to arouse the interest of such children in activities, so they will learn to perform the activities with success and pleasure with appropriate behaviors. • Gradually increase the challenges in the ODD student's participation in field exercises while providing increased positive reinforcement. • Group participation in field activities is highly desirable because it enhances social contacts. • Help the student to feel as though he or she has something worthwhile to contribute to the field trip. • In field activities acknowledge the contributions and assistance of the student with an emotional disorder. • Make the ODD student with the behavioral disorder become one of the field trip leader of an activity which can often reduce their disorder. • Special efforts should be made to get children with behavioral disorders to interact with other children. • Use a buddy system. • Use appropriate general strategies. • You should encourage children to practice field skills during their free hours. • Be sensitive to the ODD student's reactions to the various aspects of assessment. • For each student, accumulate in his or her portfolio several examples of work (quizzes, assignments, projects) that demonstrate knowledge of the subject matter or the unit of study. 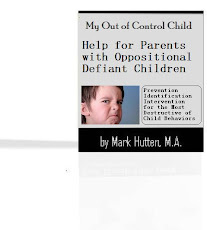 • Make special arrangements for the ODD student with an emotional disorder according to what their special needs are and that they do not compromise the integrity of the testing situation. • Provide private room/smaller group setting/alternative test site (with proctor present); alternatively screens to block out distractions. • Stay on top of ODD student progress through informal assessment, don't wait until it's too late to discover that there is a problem. • Be embarrassed if material is not appropriate for their age levels. • Become frustrated if material is too difficult. • Feel bored with curriculum that is beneath their ability, or involving material that is not interesting to them. • Feel defensive and disrupt the classroom to protect their egos, attempt to restore their "image" before the class. • Feel like giving up if instructional delivery is too rapid. • The result of delayed social skill development or underdeveloped adaptive behavior skills. • Adapt and modify materials to reduce the effect of the disability on classroom performance. • Choosing materials that are of high interest to the ODD student. Have him select his own materials when possible. • Ensure that materials are appropriate for your youngster's age level. • Ensuring that instruction is delivered at or slightly above the youngster's current skill levels. Individual achievement assessment can provide information on a ODD student's skill levels that can be used to identify skills a ODD student needs to learn and provide guidance for selecting materials. We have joined with Online Parent Support to create a single resource for parents, teachers, and mental health professionals who deal with the challenges of "difficult" children and teens. This web site provides articles, educational resources, links to local, national and international support groups, sources of professional help, lists of camps and schools, conference information, recommended reading, and moderated support message boards. We strongly believe that all children and teens faced with behavioral challenges have the right to – and deserve – appropriate education, inclusion, support, and understanding so they and their families may enjoy the highest possible quality of life. DifficultStudents.com. Awesome Inc. theme. Powered by Blogger.